Sprengel deformiy is also known as congenital hip scapula or undescended scapula. Sprengel deformiy is a condition that are presented with small scapula with restricted range of movement, congenital elevation of the scapula and other congenital anomalies that may present. Sprengel deformity is diagnosed within the first few years of life. It may present at birth or discovered after the child start to use the arm. Surgery is performed to correct the abnormalities . Satisfactory result of the surgery may be achieved at the age of fourteen. However the surgery is typically performed on the patient between the age 2 - 8 years old. Sprengel deformity is a rare condition. It is more common in girl than boy (3:1) and the incidence is less than 1 per 10 000. The risk factors of developing Sprengel deformity are congenital fusion of the cervical and myelomeningocele. Sprengel deformity is known as a sporadic condition . Only a small amount of cases are associated with familial form of inheritance which is autosomal dominant in nature. Normally the scapula will appear in the 5th week of the life of the embryo opposite the C5- T1 segment in the neck. It will later migrate to its position in the thoracic region . 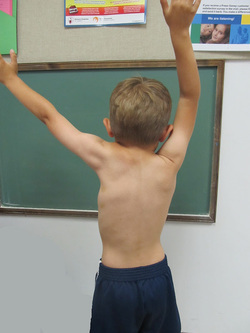 Sprengel deformity is associated with failure of the descent of the scapula. This may occur as a result of defective formation or later muscle contraction. A theory suggests that a present of an abnormally bleb of cerebrospinal fluid will interfere with the descend of he scapula. Sprengel deformity is associated with renal malformation, syringomyelia, congenital scoliosis, myelomeningocele, cervical fusion, Klippel-feil syndrome and malformation of the limb which appear sporadically. Sprengel deformity is mostly unilateral. However in certain cases it may be bilateral. The patient present with elevated and small scapula. The scapula is rotated so that he glenoid fossa faces downward more than normal. This position will face the superomedial pole furter to the spine and inferomedial spine closer to the spine. In the base of the neck, the superomedial pole is prominent. In comparison with the opposite sides, the neck angle on the side that is affected will appear more blunted. There are variant of degree of severity, from barely noticeable to obvious deformity. The motion of scapula is decreased and the glenoid turned downward. Those conditions will limit the abduction of the arm. This will cause the patient when reaching upward to tilt the trunk. This condition is the first indicator of Sprengel deformity. Inspection of the angle of he neck from posterior and anterior aspect may reveals a prominent scapula ( Omovertebral bar). 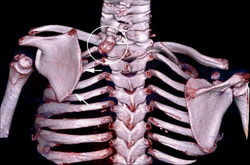 Bony connection to the spine is checked by palpating the superomedial aspect of the scapula. The range of movement is checked especially the neck range of movement or the abduction of the arm scoliosis is checked by performing the spine - bending test. Hearing test is considered in patient with congenital cervical fusion as hearing abnormalities may present. Radio graphic image is useful to rule out scoliosis in the thoracolumbar spine or associated congenital anomalies on the cervical spine.Ultrasound of the bladder, ureter and kidney are considered to detect for any abnormalities. Pathologically,the scapula is smaller than normal. The upper portion of the scapular is attached to the spinous process of the upper and lower thoracic spine by a cartilage known as omovertebral bar or bar of bone. The upper portion of scapula is abnormally curved forward. Hypoplastic muscles are normally attached to the scapula. The differential diagnosis may include birth palsy and congenital cervicothoracic scoliosi. The birth palsy which affect the upper portion of he brachial plexus may lead to abnormality to abduct the extremities. The use of the arm in this condition may resemble Sprengel deformity. 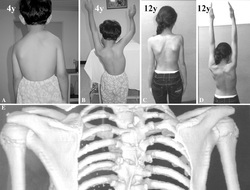 Distortion of the ribs and trunks in congenital cervicothoracic scoliosis will gives an appearance similar to sprengel deformity. After shoulder dislocation, injury to the axillary nerve may lead to an inability to abduct the shoulder as a result of deltoid muscle weakness. Winging of the scapula as a result of damage to the long thoracic nerve and bilateral shoulder weakness as a result of fascio scapular humeral dystrophy form part of the differential diagnosis. The patient should be observed during the 1s few years to determine the degree of visibility of the deformity and it affects on the function of the arm. Strengthening and stretching are considered initially. No restriction to any activity. Physical therapy is useful to improve the range of abduction in a non operative cases. Passive and active stretching exercise are considered. The family is able to assess the success of the physical therapy over the first 2- 4 years of the patient's life. Surgery is not mandatory. Surgical relocation of the scapula is the option if the patient unable to accept the degree of deformity or there is a limitation in the abduction of the arm. Several techniques are involved which includes detaching the muscle from the insertion or origin. The results of the surgery may lead to an improvement in the range of abduction. However, complete restoration of the function and appearance to normal is sill questionable. The back incision tend to spread and become wider than incision in other areas. The affected sides appear to be weaker than the contralateral side.The deformity is static and stable which doesn't improve or worsen with times. Arthritis of shoulder is not associated with sprengel deformity. The complication of sprengel deformity are widen incision scar, incomplete correction, weakness of the shoulder muscle and brachial plexus stretch . The child who suffer from sprengel deformity should visit the surgeon - 12 months apart. Patient age 2-8 years ofl are considered best /suitable for surgery. However, surgery appear to be successful in younger and older patient.